Leading Manufacturer of border work fabric, digital lace fabric and to tone embroidery fabric from Surat. We are one of the well-known manufacturers and suppliers of Border Work Fabric. The offered border work fabric is very beautifully designed, ladies clothing material. 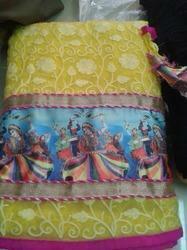 Our supplied border work fabric is widely liked by girls and women of all age groups, sections and ethni cities. The offered border work fabric is available at very affordable market price. We are one of the leading manufacturers and suppliers of Digital Lace Fabric. The offered digital lace fabric is beautifully designed for girls and women of all age groups, sections and ethnicities. Our supplied digital lace fabric is very popular among college going girls and working women. 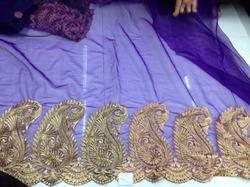 The offered digital lace fabric is available at very affordable rates. Looking for Designer Saree Borders ?